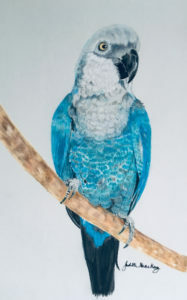 Artists and Biologists Unite for Nature (ABUN) have been approached to create artworks of the Spix Macaw to help bring public awareness of this beautiful Parrot and the hope to successfully reintroduce it into is historical habitat in the wild. Sadly the only Spix Macaw that exist are in capitivity. This is my painting of this stunningly beautiful bird. Its in pastel pencil on light grey PastelMat.